This unique pump eliminates a physical connection between the motor and the impeller and turns the impeller with a magnetic drive. 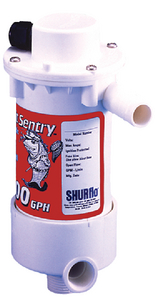 If the pump is dry or the impeller is clogged, the motor can run dry without damage. Patented anti-airlock feature allows the pump to clear trapped air. Includes a dual port for easy washdown pump connection. Ignition protected.